1 This paper offers an analysis of Amos’s life story text (see Appendix) which employs an analytical method combining theory and methodology from sign-oriented linguistics and socio-psychological discourse analysis and interpretation from a narrative paradigmatic approach. The goal of this interdisciplinary method is to understand the internal experience of the narrator by analyzing the linguistic meanings and extra-linguistic messages of his discursive choices. This analytical view, focused on the individual as well as his perceptions of his society and its expectations, forges a connection between the narrator’s text, his inner psychic world, and the attributions and meanings he attaches to his experiences. This is accomplished by identifying the non-random distribution of linguistic signs in the discourse and hypothesizing about the connection between this specific use of language and the extra- linguistic text meanings, and between these meanings and the larger individual and societal implications. 2 The communicative oppositions and choices within the text, distinguished by clear discourse markers, reflect both the narrator’s worldview and his reciprocal relations with the world and society surrounding him. This analytical method asks the questions, “How could this have been said differently?” and, “How might the choice of alternative linguistic forms affect the extra-linguistic message of the text?” The fundamental procedure of placing the narrator’s discursive choices into comparative context with a range of possible alternative choices allows a multi-dimensional and open-ended interpretative perspective. This integrative method interprets both the form and content of the text, on both the micro and macro levels, in a cohesive manner in order to arrive at a comprehensive and holistic narrative analysis. 3 This special issue follows the philosophy, put forth in the introduction by Spector-Mersel (2014), that the interpretation of narratives is “an open, multi-dimensional endeavor, which allows the co- existence of multiple analytical perspectives” (p. 4). The “open- endedness” of qualitative interpretation is often viewed by positivists as a weakness, but we see the concept that there is no single, universal “truth” and no one “correct” way of looking at a text as one of the greatest gifts of narrative analysis. Discourse analysis, as practiced in many academic fields, employs this view of interpretation but is often seen as not fitting the description of holistic narrative analysis. Indeed, Lieblich, Tuval- Mashiach, and Zilber (1998) classify traditional discourse analysis into the categorical-form cell within their four-celled matrix of modes of reading a narrative, and emphasize its focus on “discrete stylistic or linguistic characteristics of defined units of the narrative (p. 13). Discourse analysis does often look at language through specific and categorized boundaries, but the interdisciplinary method put forth in this paper is unique in its exploration of language distribution across the entire text and on multiple levels, uncovering a comprehensive extra-linguistic message from a holistic view of the linguistic meanings within. This basis in holism positions our method firmly within the narrative paradigm (Spector-Mersel, 2010), which is holistic by definition and design. We also view our method as crossing many of the boundaries of Lieblich, Tuval-Mashiach, and Zilber’s (1998) matrix, or at least, as utilizing multiple perspectives and tools therein—as we focus on both form and content, and alternate between “zooming in” and “zooming out” from both categorical and holistic viewpoints. 4 The Columbia School (CS) of sign-oriented linguistics, upon which our method is primarily based, was originally used in analyses of specific grammatical systems, validated by qualitative explanations of sentences in context. In 1969, William Diver’s seminal article on the Homeric verb validated the meanings of the Homeric Greek verb tenses according to a quantitative analysis of their total distribution within The Odyssey. His analysis demonstrated that the sentences containing the specific verb tense forms signifying high relevance presented all the important events of the plot and fundamental details of all the major characters, while the sentences the specific verb tense forms signifying low relevance provided all the elaborative descriptive and additional background details. Diver’s (1969) introduction of qualitative and quantitative analyses and motivated explanation of the non-random distribution of linguistic forms, which could be directly related to the empirically postulated extra-linguistic messages of texts, thus represented the first use within linguistics of what is referred to today as holistic narrative theory. The interdisciplinary method presented in this paper rests on both this holistic linguistic theory and methodology, and on a socio-psychological narrative approach. 5 Within the two levels of interpretation proposed in the introduction by Spector-Mersel, we view the CS analytical method as existing primarily within the “what” realm, dealing with the questions of what is being said in the text and how it is being said. The analysis stays bound to the text at every point and every level, focusing on the non- random distribution of the language. The “why” realm comes into play at a later point, when possible empirically-motivated explanations are proposed for the extra-linguistic messages that emerged from the linguistic analysis. However, the interdisciplinary strain of the analytical method employed in the present paper also brings in a socio- psychological perspective, which is concerned with the “whys” within the “whats” and “hows.” Here, the “why” does not necessarily exist on the macro level, but rather on an interim interpretive level, asking “whys” about the “whats” and “hows.” Whereas CS analysis suffices with a discussion of the language and its distribution within the text, our method of analysis here goes beyond this, asking why this language exists here and not there, why the narrator may have chosen to use this language, and why this particular extra-linguistic message seems to be important to him, both from a personal and societal perspective. 6 This article was invited to exemplify a specific theory and methodology of discourse and text analysis that has been developed over the past 35 years, and various aspects and applications of the method have been published in an extensive number of anthologies, monographs, and articles (Andrews & Tobin, 1997; Aphek & Tobin, 1988, 1989/1990; Blum-Kulka, Tobin, & Nir, 1981; Contini-Morava & Tobin, 2000; Contini-Morava & Sussman Goldberg, 1995; Davis, Gorup, & Stern, 2006; De Jonge & Tobin, 2011; Dreer, 2007; Gorlach, 2004; Kirsner, Contini-Morava, & Rodriguez-Bachiller, 2004; Perez & Sagy, 2011; Perez & Tobin, 2009, 2010; Perez, Tobin, & Sagy, 2010; Reid, Otheguy, & Stern, 2002; Tobin, 1988, 1989a, 1993, 2002, 2005; Tobin & Perez, 2009; Waisman, 2010). The analysis here utilizes the CS, a semiotic or sign-oriented linguistic approach originally inspired by Saussure (1916/1983) and expanded upon by Tobin (1990, 1994/1995). Both language and text are defined as “a system of systems composed of various sub-systems” (p. 7) which are “organized internally and systematically related to each other and used by human beings to communicate” (p. 47), and the structure of language is seen as shaped by its communicative function and by its users’ characteristics. Complex semiotic systems are composed of linguistic signs—defined as signals of any size (syllable, word, phrase, sentence, etc.) associated with individual meanings, which must share a common semantic denominator in order to fit into the same semantic and grammatical systems (Tobin, 1990, 1994/1995). While each linguistic sign has only one invariant meaning that motivates its distribution in language, this consistent, unitary meaning can produce many extra-linguistic messages in diverse linguistic and situational contexts (Tobin, 1990, 1994/1995). 7 This analysis rests on the fundamental assumption that the linguistic sign can be analyzed as an individual unit within a number of potentially interrelated semiotic systems in order to gain insight into the larger messages of a narrator’s discourse. Human beings tend to assume that we know the signs and signals of our own language a priori, but it has been contended that we—humans, in general, and linguistic analysts, in particular—must begin “from scratch” each time we confront a potential sign, creating hypotheses anew regarding both the signal and its meaning, and the manner in which both are employed in creating new extra-linguistic messages by different speakers/writers in diverse linguistic and situational contexts (Tobin, 1990). The choice of each member in these binary oppositions directly affects the extra-linguistic message the encoder aims to convey. The unitary, invariant meaning of each linguistic sign thus motivates its non-random distribution in language to create different messages, and the analysis of the non-random distribution of signs allows an understanding of the extra- linguistic message(s) of a text and the motivations behind the narrator’s choices. 9 The analytical method presented in this paper integrates sign- oriented linguistics with psychosocial discourse analysis techniques and theory, by means of a focus on the Modern Israeli Hebrew (MIH) pronoun and tense systems and their particular use in the analyzed text. In this sense, we utilize the theoretical background on these language systems as a conceptual framework for understanding the data. In doing so, we apply the linguistic meanings assigned to the systems to the discourse, while interpreting the connections between the discourse and the psychosocial world of the speaker. Thus, the MIH pronoun and tense systems will now be discussed and interpreted linguistically, as a conduit to understanding the methodology in action in this analysis. 11 The first-person singular pronoun (ani in Hebrew; I in English) signifies “encoder,” referring to “the one who speaks here and now,” and can be considered the most proximate and personal pronoun, as it is ego- centered. It is the most specific or “known” pronoun, leaving little ambiguity as to the identity of the speaker. This form is used to relate to personalized events, actions, or states, and cannot represent a relation to anything or anyone but the encoder. As Pennebaker (2002) notes, “The use of 1 st person singular (I, me, my)…provides insight into people’s social identity and ‘ownership’ of their speaking or writing topic” (p. 8). Alternatively, the first-person plural pronoun (anachnu in Hebrew; we in English) signifies a plural or collective encoder, which is also ego- centered but indicates more than a solitary individual encoder. This requires further interpretation of the identities of those who comprise this collective entity and the reasons for this discursive choice. 13 The tense system in MIH can also be understood in terms of its invariant meanings and potential interpretive messages, revolving around signs indicating what are referred to as “traditional simple” past, present, and future tenses. This traditional analysis, however, is not fully accurate because these tenses are not limited in time (e.g., the present tense can refer to events in the past and the future) or function (e.g., the past tense can refer to hypothetical events in the present and future, and the future tense functions as an imperative). Therefore, an alternative CS analysis centered on the Space-Time-Existence system has been proposed, one “whose semantic substance deals with the placing of events/actions/states in their spatio-temporal-existential relation to the speaker at the point (or the ‘here and now’) of speaking” (Tobin, 1989b, p. 63). Within this system, the invariant meaning of the “present” tense is proximate, while that of the “past” and “future” tenses is remote with regard to the encoder. Furthermore, the Space-Time-Existence system is interlocked with the Experience system, the “semantic domain” of which is “the speaker’s ability to perceive or experience an event/action/state” (Tobin, 1989b, p. 63). Within this system, the invariant meaning of the “present” and “past” tenses is experienced, while that of the future tense is not experienced. 14 Thus, there are two interlocked semantic sub-systems of the MIH tense system: 1) the “past” tense means remote and experienced; 2) the “present” tense means proximate and experienced; and 3) the “future” tense means remote and not experienced (Tobin, 1989b). Furthermore, the use of particular tenses in an individual’s discourse may not be determined by the actual time of occurrence of the described event/action/state, but rather by the encoder’s perception of these events/actions/states with regard to proximity and “experience-ability” (Tobin, 1989b). A speaker may thus use one tense rather than another to express his attitude about what he is describing. An example might be the use of the proximate-experienced “present” tense to describe events that objectively occurred in the past, but are perceived by the encoder as being relevant and “close to his/her heart”—often referred to as the historical present tense in the traditional grammar system. Therefore, “the consistent and systematic preference of one verb tense over another…may tell us something about the encoder’s attitude toward those actions, states, or events, and/or indicate his particular world view” (Tobin, 1989b, p. 65). 15 Both linguistics and discursive social psychology investigate the choice of language forms by individuals within their social contexts, but do so in quite different ways and from different angles. Linguists explore discourse in order to understand the intricacies of the choice and meanings of the linguistic forms, while social psychologists explore the user of the discourse and how the language reflects his/her attendant behavior and attributions. Kroger and Wood (1998) write, “At the most general level, the topic of social psychology is discourse because it is in and through discourse that the specific topics of interest (e.g., attribution, social comparison) are constituted” (p. 269). Thus, discourse is viewed by traditional social psychology as the means rather than the end; the reflection of (or conduit toward understanding) a personal, interpersonal, or societal reality, rather than a phenomenon to be understood in and of itself. 16 Discourse analysis is the term most often used within the social sciences for the type of text analysis routinely conducted within CS linguistics. However, this method focuses more on interpersonal and societal meanings, and on the social construction of these meanings. Widdowson (2007) discusses two broad areas that he views as comprising discourse analysis: “how people make meaning and make out meaning, in texts,” on the one hand, and how meanings are “socially constructed so that expressing them is effectively a kind of social practice,” on the other (p. xv). Wetherell (1998) goes even further, contending that discourse can actually be equated with the overreaching human process of making meaning itself. Discursive psychology, the larger academic sub-field, holds as its central assumption that “the phenomena of interest in social and psychological research are constituted in and through discourse” (Edwards & Potter, 1992; Potter & Wetherell, 1987). Within the post- structural view, there is a greater focus on the interactive and dynamic relationship between identity and discourse. Following Francis (2002), Andersson (2008) writes, “There is no ‘real’ self or ‘authentic’ identity independent of the discursive environment; rather, people are positioned by particular discourses as coherent selves” (p. 143-144). This is, in many ways, an important point of convergence between psychosocial discourse analysis and linguistic theory. 17 Discourse analysis in the social sciences purports to study the intricacies of the language employed, but we have found that analyses can appear less comprehensive and may be less associated with a specific linguistic approach or theory. Kroger and Wood (1998) refer to a reliance on “an extensive set of devices or strategies for examining discourse in a variety of ways,” but the focus is most often placed more on the speaker than on the speech, and more on the larger social meanings and contexts than the specific use of language in a specific point in time (p. 270). Indeed, Kroger and Wood (1998) state that “discourse analysis attempts to elucidate the social functions and consequences of discourse” (p. 271). While this brings in an important perspective, it leaves the exploration of the language itself somewhat incomplete, as it may be lacking a basis in a specific linguistic theory. 18 Kroger and Wood (1998) have suggested that the field of discursive psychology is in current need of a conceptual shift toward the idea that talk itself is the “event of interest,” as it is the discourse itself that constructs the reality illustrated in the aforementioned “topics of interest.” Similarly, Potter (2003) points to “a positive recognition of the primacy of discourse as a medium for action,” suggesting the necessity for a combined analytical focus on language and behavior as intimately connected (p. 785). Kroger and Wood (1998) called for a new method within discursive psychology, one that involves “increased conceptual and methodological rigour,” rather than “a decline into a mushy, relativistic, touchy-feely methodology,” and that “must be suitable to penetrate beyond the common-sense appearances of social interaction” (p. 270). They suggested going “back to the data, to the initial utterance, to the performative force of these initial actions,” seeking and identifying patterns in the discourse and requiring that hypotheses be fully supported by evidence (p. 270). This is precisely what CS linguistic analysis does. 19 Indeed, the traditional CS approach focuses on the non-random distribution of language and the invariant meanings therein. It is based on specific language analyses from specific theories, which can be validated by a psychosocial perspective when necessary. The extra-linguistic message, not in itself considered part of the linguistic theory, is then inferred and proposed—a presumably plausible hypothesis that can be accepted and shared by encoders and decoders. While this extra-linguistic inference is often an important part of an analysis, it is not viewed as a requirement or as the “ultimate answer” of the linguistic analysis. In contrast, socio-psychological discourse analysis places far less emphasis on the specifics and mechanics of linguistic forms and patterns, and much greater focus on the manners in which people and things are constructed through talk and interaction. Indeed, the study of social discourse is essentially a study of extra-linguistic messages, and has no direct need to be associated with a specific linguistic theory. 20 Linguistics and social psychology, as academic fields, generally function independently of each other and do not appear to find it necessary to even enter into a shared discussion. We propose, however, that both are missing essential parts of the “larger puzzle,” and might thus complement each other well. The method put forth in this paper—by an author from each field—employs theoretical and methodological tenets from both sign-oriented linguistics and social psychology, in an effort to bridge this gap. We are interested in both the patterned meanings of the linguistics, and the larger individual and societal implications of the extra-linguistic messages of Amos’s life story text. 21 This section will provide both the tools and the results of Amos’s life story text analysis. We will show both how to conduct such an analysis in each of its steps, as well as what can be learned from this type of analysis. Some of the following sections will discuss the text as a whole, while others will focus the analytical lens on specific parts of the text. The final discussion will place all of the oppositions into perspective together, and present a comprehensive, multi-dimensional interpretation of the text and of Amos himself. 22 We found six systemic communicative oppositions in Amos’s text, which will be presented and interpreted here in sequence. 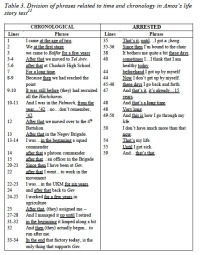 We should also note that our first analytical observation was that Amos’s life story text has two clear sections, which can be distinguished as pre-stroke (1- 35) and post-stroke (35-60). Amos’s stroke (the “zbeng,” which, as was noted in the introduction, is originally a Yiddish word meaning “a blow” or “a slap,” and is commonly used in colloquial Israeli Hebrew) represented a break in his life, and life story—a dramatic shift from being a healthy, independent, and active agent of his own fate, to being a dependent, limited, chair-bound invalid. This partition within the narrative text, found in both the content and aspects of the distribution of the linguistic forms, will be discussed as a finding in itself, and also employed as an analytical division within which other micro-level findings emerged. 23 The first step of our analysis, which might be classified by Lieblich, Tuval-Mashiach, and Zilber (1998) as within the categorical- form mode of reading a narrative, involves generating a categorical breakdown of the entire text, by pronoun, tense, verb, and/or any other relevant systematic linguistic distinction. Each of the pronouns, along with their collocated verb and additional contextual information, are extracted from the full text and condensed into lists representing each pronominal “voice.” For demonstrative purposes, this analytical step is shown in the following table. 24 This table is relevant for the first two oppositions found in Amos’s text: 1) use of the first-person singular (“I”) vs. third-person plural (“they”) subjects; and 2) use of the first-person singular (“I”) vs. first- person plural (“we”) subjects. There were only five instances of “we” and seven of “they,” while Amos used “I” a total of 61 times. Although (or perhaps because) the dominant “voice” in his life story is clearly the “I,” Amos’s uses of the other pronouns emerge as interpretively noteworthy. Each use of a non-“I”-pronoun seemed to come as a direct response to the “I”-statement either before or after it, and so can be viewed as employed by Amos (consciously or not) to send a specific message. 25 There are two predominant examples of the first opposition. The first occurs in the second and third sentences of Amos’s life story: “I came at the age of two. I came—(they) brought me” (1-2). Here, he initially attempts to send the message that healone immigrated to Israel, seemingly of his own accord. Amos then states again, “I came,” but corrects himself by emphasizing that he was indeed brought by a heretofore-unknown “they.” It is interpretively significant that Amos both restates his original message of independence and presents “the actual facts.” When weighed against the alternatives (i.e., “My family came when I was two,” or, “They brought me when I was two”), Amos’s use of a direct opposition between “I” and “they” sends the message that he wants to be seen as self-sufficient, brave, and perhaps, precociously Zionist. This can be interpreted within the hegemonic, ideological Zionist societal discourse surrounding him during his formative years, which prescribed all of these characteristics as the “correct” and “acceptable” way to be. 26 The second example involves Amos employing the same pronoun opposition in the opposite order, but in a similar message: “I worked for a few years in agriculture. After that, (they) assigned me—(they) assigned, I took on the task of establishing a factory…” (24-26). Here, Amos starts by talking about his agricultural work as a member of the kibbutz collective. He then shifts to the unspecified “they,” stating twice that the task of establishing a factory was assigned to him by an external party; presumably, the kibbutz collective or the decision-makers therein. Amos then corrects himself, again by repeating the initial statement and then bringing in what he sees as the “real facts.” Here, he employs this opposition to emphasize his own hard work and entrepreneurship, as he wasn’t just assigned a task, but rather, took on this substantial project. Again, given that Amos could easily have omitted these two references, this message comes across as meaningful and significant. Perhaps Amos wants to emphasize that this project was not initially his idea, but that he made it his own and ultimately successfully accomplished this tremendous task, on his own. 27 It is also analytically significant that all of Amos’s uses of the third-person plural (“they”) form do not make use of the pronoun itself. This “pro-drop” construction employs the unmarked MP verb as the generic subject, with no requirement to identify who the specific “they” may be. 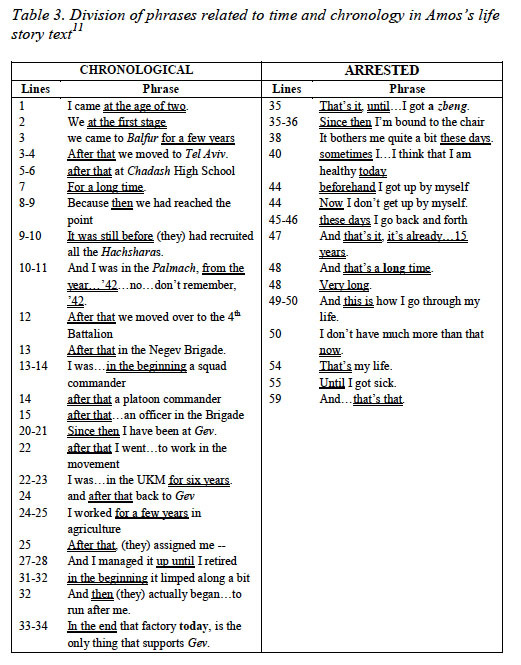 In fact, Amos uses this technique to refer to a variety of different “they’s”: first, his family (1-2; 4); then, the officers of the Palmach (10; 14); then, the “powers that be” at KibbutzGev (25; 30-31); and then, presumably, the same decision-makers at Gev (31-32; 38-39). The only instance of Amos’s use of the third-person plural form with a collocated definitive indication of specific identity comes when he refers to “my mother’s family” (2-3, 6). 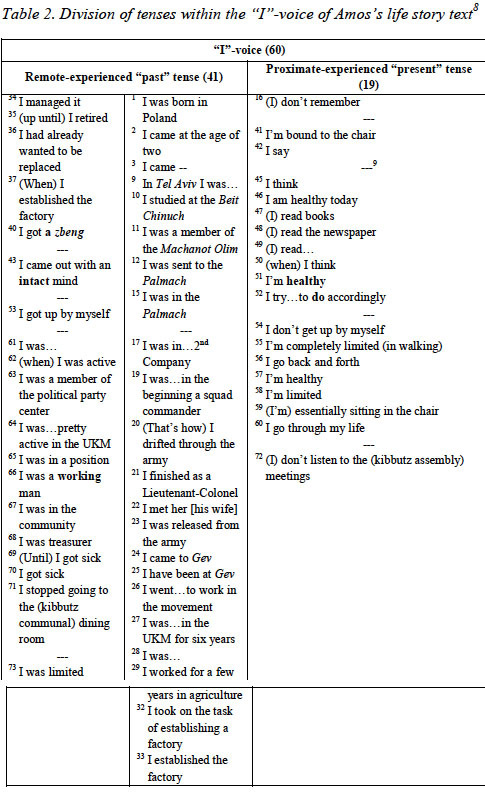 This pattern of discursive choices serves to create a sense of depersonalization and “genericization” of the “they” voice in Amos’s story, as the use of the third-person plural signifies a de- focusing on the agent, similar in purpose to the use of the passive verb form. In contrast, the use of the “I” confers and imposes upon Amos a sense of agency and action performed by him and only him. This can be interpreted as a message that only he is the main actor in his life story, and all other figures exist therein only as vague, amorphous supporting characters. Even his family appears as a non-elaborated afterthought, identified or not. Some of these supporting actors may have helped him more or less on his journey, but all took a distinct “backseat” in his own action-oriented, hard-working, independent, courageous (early) life course. 29 Amos continues in the collective, familial “voice”: “After that we moved to Tel Aviv” (3-4). Immediately following this, however, he says, “In Tel Aviv I was…I studied at the Beit Chinuch…” (4-5). With this, Amos’s reference to his family ends; they do not appear in his life story again. This may confirm the previous message that supporting characters make appearances in Amos’s narrative only as backdrops, or as vehicles to transport or guide him to the next setting or accomplishment. Here, his family “helped” to bring him, first to Balfur, and then to Tel Aviv, and then vanished from the story. Amos “took it from there,” and his reference to his Beit Chinuch studies thus begins a long list of accomplishments, none of which further involve or show any influence from his family. 30 The next example is another “triple opposition”: “Within this framework I was sent to the Palmach. Because then we had reached the point that all Hachshara provided a quota for the Palmach. It was still before (they) had recruited all the Hachsharas. And I was in the Palmach…” (7-11). Again, Amos places the “I” in direct juxtaposition with the “we” and the “they.” The specific identities of the latter subjects are unspecified, but the opposition sends a message nonetheless. As viewed through the initial use of the “I,” Amos himself was sent to the Palmach, on his own and not as part of any collective. He then positions himself as a member of a group—perhaps the Machanot Olim, or the elite Palmach fighters, or the larger collective of Israeli men. The pronominal subject is ambiguous, but the message is not: Amos belongs. In this context, in this moment of his life history, he was part of something. This is the first “we” that does not involve or include his family, and it is a significant one. 31 Amos then shifts his focus to the unspecified “they” who had conducted the recruiting, perhaps to further emphasize the elite nature of his selection for the position, and concludes his discussion of the Palmach by returning to an “I”-focus. Amos then provides the final opposition between “I” and “we”: “I was in…2 nd Company. After that we moved over to the 4 th Battalion…” (11-12). This discursive shift is in the opposite direction from that above, and may be interpreted within the context of military philosophy and practices, wherein the physical, emotional, and mentality shift from individualism to collectivism is, perhaps, the hallmark of induction. Amos is sending the discursive message that he began his military service as an “I,” but by his next assignment, “he” had become part of a “we.” This builds upon the “we” in the example above, further confirming the hypothesis that Amos is emphasizing his sense of belongingness. 32 In the final analysis of this opposition, analytical attention must be paid to the specific (or non-specific) identities of each of the subjects within the “we”-voice of Amos’s text. The first three “we’s” occur in a cluster (2-4; 5, 7, 8), and all refer to Amos and his family, although specific identity is unclear (i.e., nuclear and/or extended family, and who exactly comprised the members). The fourth “we” (8-9; 13) is also unclear, but the final “we” is unmistakably army-related (12; 18). Nonetheless, this “4 th Battalion we” is still not fully described—Amos does not elaborate on its members’ names, identities, characteristics, or even indicate how many there were. The dominance of the “I”-voice in Amos’s life story, coupled with the vagueness and lack of elaboration regarding the collective subjects, provides further evidence for Amos’s message of independence and self-sufficiency, at least during the first half of the text. 33 The third opposition regards Amos’s use of active vs. passive discourse. We interpret active discourse as reflecting control, responsibility, and commitment, and passive as a lack of control and/or responsibility and/or commitment. 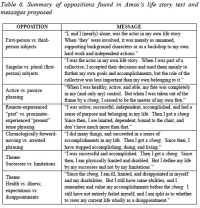 In this context, the use of the non- specified, generic third-person MP impersonal subject also performs a discursive task similar to the passive voice, sending a message of “de- focusing on the agent.” There are many examples of this in Amos’s text, some which have already been presented within the other oppositional categories. For instance, Amos’s statement, “I came at the age of two. I came -- (they) brought me,” (1-2) can be viewed not only within the “I” vs. “they” opposition, but also as an opposition based on locus of control. The pronoun shift itself transfers Amos from the position of actor in his story to that of being acted upon. Similarly, Amos’s discursive choice to distinguish between being “assigned” to establish the factory and taking on the task himself (25-27) is representative of the opposite shift. That is, Amos takes himself out of the realm of the passive receiver of others’ actions, or being handed down a task by the amorphous “they”—and places himself discursively into the active, responsible role. 34 Another significant example lies in Amos’s discussion of his Palmach experience: “I was sent to the Palmach” (8), and shortly thereafter, “And I was in the Palmach…” (10-11). The Hebrew construction creates a stronger opposition, but even in English, the distinction between being sentto and being in an organization is apparent. In the former, the locus of control and action is placed squarely on an external party, while in the latter, only Amos is responsible for his remaining there. Given the prestige and honor associated with Palmach membership, it is unclear why Amos chose to emphasize that he was initially sent, rather than choosing to enlist of his own accord. Perhaps members of his youth group had to be chosen for enlistment, and perhaps having been selected for this role by this external entity was part of the honor. 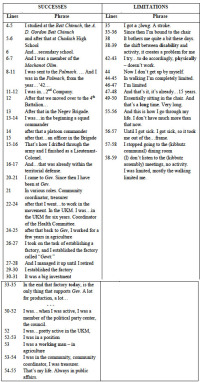 35 A similar choice for active phrasing is shown in Amos’s statement, “I was released from the army” (20). Although this appears, in its English construction, as more passive phrasing, the Hebrew construction must be placed in contrast to the alternative, which could have been, “(They) released me from the army.” In this case, there is no more active alternative, other than “going AWOL,” which is not consistent with Amos’s actual life history. These examples demonstrate Amos’s patterned discursive choice to place himself into the active locus of control wherever possible in the first part of his life story. 36 In the post-stroke section, however, Amos presents two distinctly different examples of this opposition. The first was, “It bothers me quite a bit these days. Meaning…the shift between disability and activity, it creates a problem for me…” (38-39). Here, he employs the pronoun “it” twice, defining “it” as his difficulty dealing with the physical consequences of his stroke and his inability or unwillingness to fully accept his limitedness. Similarly, Amos states, “I got sick, so it took me out of the…frame,” (55-56) where “it” can be interpreted as standing in for either his illness or the resulting disability. What is significant in these three examples is Amos’s placement of this “it” as the actor, or perpetrator; that is, as a personified force that first “bothers” and then “creates a problem,” and finally, takes him “out of the…frame” entirely. When considering the many possible alternatives for this message, we could imagine, for instance, “I am quite bothered by it these days,” or “I am having a problem with…”, or “I went out of the frame because of it.” All three options, while still expressing difficult experiences and unpleasant feelings, place Amos as the main character and experiencer— rather than focusing on his illness as the perpetrator of these unfortunate circumstances. 37 The fourth opposition involves Amos’s usage of “past” vs. “present” tense, or, as is conceptualized in Tobin’s (1989b) Space-Time- Existence system, remote vs. proximate experiences. As was apparent in Table 1, all of Amos’s uses of “we” and “they” were collocated with a remote-past-tense verb. 7 His usage of “I,” however, was divided between the remote-past and proximate-present tenses, with the former being used approximately twice as often as the latter. The following table shows the partition of the “I”-voice into these two tenses. 38 The non-random patterns in Amos’s discourse emerge as clearly evident. The remote-past “I” is filled with actions, roles, membership and belongingness, jobs, and accomplishments. Amos’s stroke is first introduced in this “voice” (40), but the resultant negative effects and limitations do not exist here. Indeed, directly following the “zbeng,” Amos immediately returns to his “intact mind” (43), abilities (“I got up by myself” (53)), and another substantial list of his pre-stroke roles and accomplishments. He returns to having “got[ten] sick” (69-70) then concludes the remote-past “I”-voice with a single reference to his post- stroke non-activity. The final entry is perhaps the most significant, as Amos’s choice to use the remote-past tense (“I was limited” (73)) places this concluding statement in the remote-experienced realm, rather than the proximate-experienced or extended, habitual present. When questioning the alternatives, “I am limited,” seems a plausible option, especially in light of the many similar statements in the proximate-present “I”-voice. Amos’s choice here, as well as its placement as the final “I”-statement of his life story, therefore, emerges as highly meaningful. Perhaps he hopes to place his limitation and illness into the proverbial remote past, or perhaps he simply refuses to allow his disability to remain forever in the extended proximate realm. 41 The first column shows Amos’s significant number of accomplishments, listed chronologically and sequentially. In this “chronological voice,” Amos uses the phrase, “after that,” nine times, in addition to various time-focused phrases such as, “first stage,” “a long time,” “before,” “from the year,” “in the beginning,” “for six years,” “for a few years,” “up until,” “then,” and “in the end.” This first section of his life story is filled with forward movement, action—essentially, life. Amos seems to send the message that this chronological list of accomplishments and milestones is the essence of his life, and what he perceives as a successful life. His lack of elaboration on any of these list entries can be interpreted as his sense that what is important is the existence itself of each accomplishment in his life history, and not the stories behind them. His repeated use of, “after that,” can be seen as Amos walking his audience through this important list, making sure that nothing is left off or provided out of sequence. This repetitive phrase gives a sense of forward movement through time—a life that is following its “correct” path, in a positive direction. 42 All of this is halted with the single sentence, “That’s it, until…I got a zbeng” (35). From this point on, Amos’s discourse is filled only with phrases that stagnate and are essentially arrested in time. His repeated use, in this second section, of, “that’s…”—as in, “that’s it” (35, 47), “that’s that” (59), “that’s a long time” (48), and “that’s my life” (54)—stands in direct contrast to his repetition of, “after that,” in the first section. Indeed, this opposition displays the dialectic between forward movement in the first part of Amos’s life story, and backward-facing, static rumination in the second. In his post-stroke life, Amos focuses on what he does “these days,” “today,” or “now,” and when he does venture beyond the extended present moment, it is only to compare his current disability with his past abilities—as in, “beforehand I got up by myself” (44), and “until I got sick” (55). The most significant information for our analysis lies in Amos’s statement that “it’s already…15 years” (47) since his stroke. Here, he volunteers evidence of the stagnant nature of his discourse, speaking of his life in these past 15 years as completely devoid of movement, action, and purpose. It is as if “the zbeng” functions as a discursive stop sign—all was fine and progressing nicely until the stroke, then everything stopped. This is reminiscent of Aristotle’s concept of denouement, a classic narrative text structure that divides a text into two sections—effectively, before and after (Miller, 1978). In Amos’s text, the stroke functions as the climax, or turning point, of the narrative, splitting it into these two sections. 43 The final set of oppositions emerges from a reading of Amos’s text that might be classified by Lieblich, Tuval-Mashiach, and Zilber (1998) as within the holistic-content mode of analysis, and exists in a number of themes found in the content of the narrative. The first thematic opposition can be characterized as a dialectic between successes and limitations, while the second is a dual dialectical theme involving health vs. illness and expectations vs. disappointments. In Amos’s case, these themes were inextricably tied together, as health and expectations seemed to converge to form one side of the dialectic against illness and disappointments on the other side. The first theme will be analyzed across the entire text, while the second will be explored only in the post-stroke part of Amos’s life story. 44 This thematic opposition appears throughout the text, and has been discussed, in part, within the context of other oppositional categories. 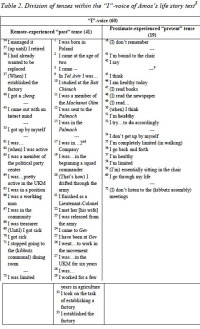 The following table presents a simple list of the events, actions, and experiences in Amos’s life (story), as perceived and presented by him in this text. It may be viewed as an interpretive leap to use such black-and-white terminology as “success” and “limitations,” but we feel there is sufficient textual evidence that Amos himself perceives these facets of his life history as such (while acknowledging that there is not, in fact, enough evidence to presume that he sees his post-stroke limitations as “failures”). 46 Even when Amos is deep in discussion of the stroke and the limitations on his activity and way of life, he chooses to return discursively to his pre-stroke life. The most significant illustration of this lies in Amos’s statement, “That’s my life. Always in public affairs” (54- 55). Even amidst repeated mentions of his limitations—being “bound to the chair” (36), limited in walking (58-59), having been taken “out of the frame” (55-56)—Amos decides to define his life by the active and successful (pre-stroke) part and not by the disabled and limited (post- stroke) part. 47 When considering the alternatives, there is no indication that Amos’s discursive decision here is the “obvious choice.” On the one hand, because his pre-stroke life encompassed 70 years and his post- stroke life spanned only 15 years, it seems “reasonable” that he would define his life overall according to the chronological majority. On the other hand, Amos presents the past 15 years of his life as an endless, extended limbo-like state, placing great emphasis on his current distressing lack of mobility and independence. Another individual in this situation might find it quite “reasonable” to go down a path of depression, related to an appraisal of his entire life based on his current physical and emotional state. But Amos seems to find comfort in placing his identity into the pre-stroke realm, wherein he was strong, active, independent, accomplished, and successful. 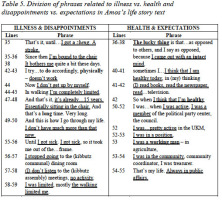 48 The table above shows quantitatively that Amos’s successes outnumber his limitations, and his statement determining that his life exists in the successes, and not in what unfortunately followed them, provides qualitative validation of these numbers and his perception of them. From a socio-psychological perspective, Amos’s perceived successes and accomplishments can be interpreted as having made him an integral part of the socialist, Zionist, pioneering elite that established, defended, and maintained the State of Israel—in which the surrounding ethos of the time encouraged Amos to take great pride. The stroke may have changed his life in a resounding, irreparable manner and limited him terribly, but it could not and did not erase his past successes and status. Amos is distressed by his disability and limitations, but nonetheless sends the message that he refuses to be defined by them. Health vs. illness and expectations vs. disappointments. 49 In addition to the partition of Amos’s life story into pre- and post- stroke sections, upon deeper examination, we also found a split within the second section itself, on which this thematic opposition will “zoom in.” Here, although Amos’s predominant focus is on his illness and disability, there is still evidence of oppositions therein. And rather than a stark discursive and sequential split between “before and after,” or between “past and present,” where Amos spoke in one “voice” and then made a single shift to the other, here Amos vacillates and spirals between the two opposed themes. 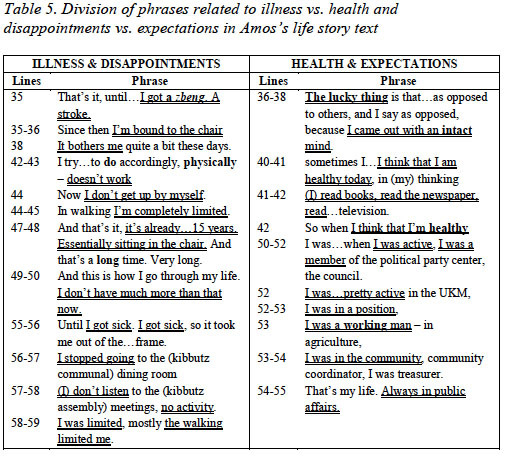 The following table presents the relevant phrases in Amos’s text related to health and illness, and expectations and disappointments, divided by this dialectic relationship. 50 We can see the vacillating nature of Amos’s discourse here, as nearly all of Amos’s statements contain the dialectic of his present experience. He is “bound to the chair” (36) but “came out with an intact mind” (37-38). He is not able to “get up by [him]self” (44) and is “completely limited” in walking (44-45), but he reads books and the newspaper (41). He thinks that he is healthy, but when he attempts a physical task, it simply “doesn’t work” (42-43). He devotes a significant part of this text section to reminiscing about “when [he] was active” (51), but then returns to remind that this all stopped when he “got sick” (55). 51 Although Amos’s life story as a whole presents a picture of a split between “before and after” his stroke, and although the second section appears, upon first glance, to be presenting the “illness voice,” even here, his discourse is divided. While he seems invested in sending the message that his present life and, indeed, the entire 15 years subsequent to his stroke, have been predominantly occupied by his illness and disability, he nonetheless presents his audience with a number of “cracks in the armor.” Perhaps, as distressing as his stroke and the resulting limitations and disappointments have been, Amos is still not willing or able to allow this to be the concluding message of his life story (and of his life). 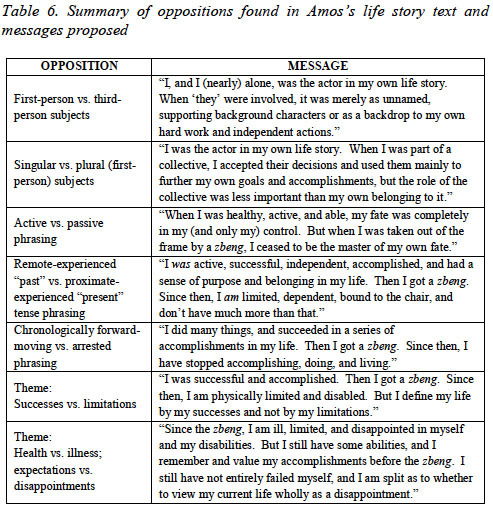 52 There are two other statements made by Amos that deal directly with this dialectic but cannot be included exclusively in either of the columns within the table above; rather, they should be placed across both columns: “the shift between disability and activity, it creates a problem for me” (38-39), and “these days I go back and forth between thinking that I’m healthy and the future, that I’m limited” (45-47). Building upon the vacillating form of Amos’s discourse, here, the content demonstrates the very dialectic under discussion. He, himself, refers to “the shift” and “go[ing] back and forth” between disability and activity and between health and limitation, and the attendant difficulties involved. Thus, Amos himself is acknowledging his inner sense of division, as he, himself, is not sure where to situate himself on the continuum between health and illness, and between expectations and disappointments—both of and in himself and in the perception of his surrounding society. Indeed, because Amos’s expectations of himself may be interpreted socio-psychologically as likely based in a worldview filled with high expectations of an Israeli man in the historical period, context, and setting in which he has lived, his personal expectations may now be inseparable from his perception of his society’s dominant expectations of him. 53 Our interdisciplinary analysis uncovered the non-random distribution of the language and oppositions in Amos’s life story in order to understand the linguistic meanings and extra-linguistic, socio- psychological messages. We demonstrated connections between the content and form, and between the micro and macro levels, and we spiraled through the analytical process, widening and narrowing the analytical lens to focus on different sections, facets, and themes within the text. Each time we asked how a particular statement could have been expressed differently, we received very different answers, depending on the analytical focus at that moment. There were several points at which we presented the same excerpts from alternative perspectives, in order to support diverse hypotheses. On the basis of a mere 60 text lines, we conducted a comprehensive analysis, finding six central oppositions in Amos’s text and proposing main messages for each of them. The following table presents a summary of these interpretive results. 54 Ultimately, it is apparent from each message, and from the collection of messages together, that the analytical focus shifted through each oppositional category, allowing us to focus differently on the text as a whole, and on specific parts of the text individually. Each message both builds on the previous one and brings in a new perspective. Each also brings its focus on its own particular opposition, and each can be taken as a finding on its own, or as part of the interpretive collective of the text analysis. 55 Taking into account all these hypothesized messages, the final analysis produces a single extra-linguistic message emerging from Amos’s life story text: I am a divided man. Amos’s text, itself, is divided into two sections: pre-stroke and post-stroke. There are two tenses: remote-experienced “past” and proximate-experienced “present.” There are two versions of perceived time: forward-moving in chronology and arrested or “frozen in time.” And there are black-and-white dialectic themes: successes and limitations, health and illness, expectations and disappointments. The entire text exists within divisions, as represented in both its content and form, on both the micro and macro levels. 56 And so, thus, is Amos himself—as the narrator of this text and experiencer of the story. He is divided literally, as his body is limited but his mind is fully intact. He is divided figuratively, as his text shows his vacillations between past and present, health and illness, ability and disability. He is divided physically, mentally, and emotionally. He is divided in his self-perception, uncertain whether to focus on his past successes or his current limitations. 57 With all this in mind, employing a final, macro-focused view on Amos’s life story, we nonetheless found pieces of evidence that suggest a slight “tipping of the discursive scale” toward a positive outlook on his life, both past and present. The first “clue” lies toward the end of his story, where Amos, discussing his limitations and need for assistance, stated, “And this is how I go through my life” (49-50). While the sentence appears, at first glance, rather dismal—and indeed, is followed by Amos’s pronouncement that he doesn’t “have much more than that now” (50)—it is significant that the phrasing is active, rather than passive. He could have said, “And this is how my life goes,” or “And this is how life is for me.” Instead, Amos made the discursive decision to place himself as the active agent. No matter how difficult and disappointing his current way of life may be, here Amos still seems to see himself as actively going through it, rather than passively having it pass him by. 58 Secondly, Amos’s statement that, “That’s my life. Always in public affairs” (54-55) sends the message that his real life, and his perception of his life overall, exists in the active, accomplished, successful realm. No matter what has happened since, his self-image is positioned firmly in that life. Thirdly, Amos made an unusual discursive choice where he mused, “these days I go back and forth between thinking that I’m healthy and the future, that I’m limited” (45-47). Although he did not actually employ the future tense, his use of the phrase, “the future,” may reflect his grappling with the scope of his current limitations, both in physical space and time. In terms of Tobin’s (1989b) Space-Time-Existence system, the phrase can be interpreted as Amos’s reflection on this remote and non-experienced state, and his concern with whether he will still be experiencing these disabilities in the remote future. 59 Finally, and related to Amos’s struggle with the dynamics of disability and time, analytical attention must be called to his essentially final concluding sentence: “I was limited, mostly the walking limited me” (58-59). There appears to be a dissonance here, wherein Amos presents his final message about his life, but uses the remote-experienced “past,” rather than the proximate-experienced “present” tense. His entire discussion of his current limitations and disabilities exists in the extended proximate “present”—and yet, here he chooses the remote-past tense. The grammatical construction stands out, and thus sends a very specific message. Amos is decidedly situating his limitation in the past, either out of wishful thinking (perhaps he hopes his physical condition might change?) or a desire not to allow this extended disabled state to define his current life. Indeed, the literature on “illness narratives” suggests that a narrator’s social experience is essentially embodied in one’s experience of and feelings about one’s bodily states and how they appear to external others. Kleinman (1988) states, “at the very core of complaints is a tight integration between physiological, psychological, and social meanings” (p. 14). All of the discursive “clues” in Amos’s narrative text seem to illustrate his inability or unwillingness to own the full extent of his disability, particularly if this comes at the price of disregarding the positive, active, successful facets of his pre-stroke life. Indeed, the stroke may have changed his present abilities, but has not and cannot change his identity as quintessentially able. Thus, despite his current disappointments, we view Amos as showing a great deal of resilience and strength in his life story. 60 One of the strengths of the interdisciplinary method demonstrated in this paper lies in its multi-dimensionality and comprehensive, integrative perspective. When viewed again through Lieblich, Tuval- Mashiach, and Zilber’s (1998) four-celled matrix of modes of reading a narrative, we can classify this analytical process as involving all four cells at different points. The holistic-content mode helped us to find the three thematic oppositions, while the holistic-form mode revealed the larger structural oppositions in the narrative, such as the pre- vs. post-stroke partition and the use of certain phrases as textual turning points. The opposition between chronologically forward-moving vs. arrested phrasing in the text can be viewed as representative of both the categorical-content and categorical-form modes, as it spiraled between what Amos said in his narrative and how he said it. And of course, the first four oppositions emerged primarily from a categorical-form mode of analysis, focused on the distribution of specific linguistic forms and meanings within the text. 61 Perhaps the greatest strength of the sign-oriented linguistic method is that it never strays from the text under analysis. At every point, interpretations and hypotheses remain strictly, intrinsically connected to the patterns uncovered in the words themselves. In this deep loyalty and direct connection to what is said lies the central possible criticism—that our method does not necessarily overtly analyze what is not said in the text. Because it focuses on the non-random distribution of the concrete linguistic data that is physically present, it does not place interpretive emphasis on hypotheses regarding what is not present, or what may appear only once in the text—unless this absence or underrepresentation creates a distinct and significant communicative opposition to what is present. For instance, Amos’s wife’s single comment in the middle of his story about their meeting was not analyzed or related to, as there was no distributional pattern to speak of. Had Amos chosen to include her in his narrative, or had she made a series of interruptions, analytical attention would have been paid to her discourse, as it would then have been possible to find linguistic patterns and relate them to the extra-linguistic text messages. 62 Although Amos’s life story has a number of notable absences and lacks of elaboration (such as regarding his family of origin and his current nuclear family), the field of sign-oriented linguistics simply has no technical theoretical tools with which to interpret this lack of language. Other than noting whether these absences may have a significant, systematic contextual pattern relevant to, or thematically consistent with, the extra-linguistic message, this method only pays theoretical attention to a systematic zero distribution. Although the basic analytical question asking, “How could this have been said differently?” may touch upon unspoken subjects or underemphasized themes, the linguistic side of the method does not specifically seek out silences or omissions that are neither systematically presented nor thematically relevant to the extra- linguistic message. We recognize that silences, in both content and form, are most certainly important from the socio-psychological perspective, however, and the absences in Amos’s text may be interpreted as significant in this view. 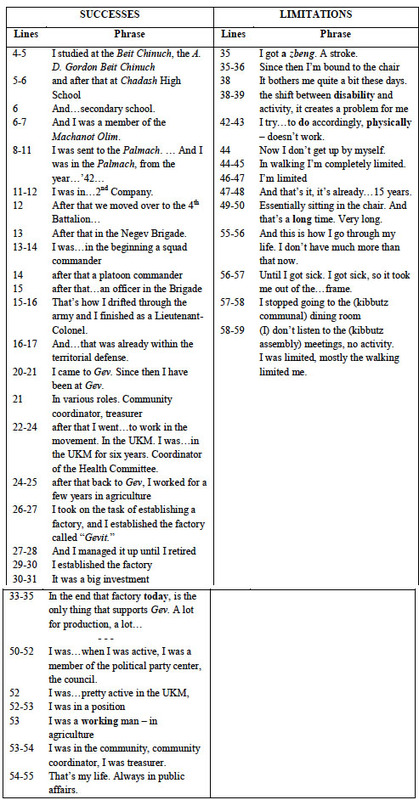 Furthermore, if we had had access to the original voice recording of Amos’s interview, we would have analyzed the additional paralinguistic and prosodic information, such as the length of pauses between words, the tone in which certain words were spoken, and emotionality clues (e.g., chuckling, crying, or intakes of breath). 63 Another strength of this method is its applicability. Any text can be analyzed using these techniques, and linguistic meanings and extra- linguistic messages can be unearthed and proposed in any textual context. Non-random distribution exists in every instance of language used by human beings to communicate, no matter how brief or seemingly unimportant. Indeed, sign-oriented text analysis has been applied in many theses and dissertations to discourse of all styles and registers, in both spoken and written form, across many languages—from literary and poetic texts to fortune-telling sessions, from political speeches to Six Day War stories, from kibbutz assembly meetings to children’s games, and even in trance parties. 64 Although the linguistic proponents of this interdisciplinary method see no direct need for reflection on the locationing of the researcher, the psychological, narrative perspective requires it. Particularly because of the inherent “Israeli-ness” of Amos’s text, it seems critical to note that the analysts here are not native to the Israeli culture. Both of the authors of this paper were, in fact, born in the United States—the first author immigrated to Israel in 2003, and the second in 1966. The mother tongue of both is English, although both are now fluent speakers of Hebrew. 65 The primary analyst of Amos’s text, in fact, sees herself as very much an outsider to the country and culture that permeates nearly every facet of Amos’s life story. She (A.S.P.) knows little to nothing about much of the Sabra ethos that fills Amos’s text, and has no direct knowledge or understanding of the significance of the Palmach, other than having read about it in textbooks. All of the “name-dropping” in which Amos painstakingly engaged—the A. D. Gordon Beit Chinuch, the Machanot Olim, the Hachsharas, all of his army units—simply had no meaning to her. As she conducted the analysis, she was able to recognize that Amos was making repeated efforts to specifically name these institutions, and from there, to propose a hypothesis that these symbolized important milestones and accomplishments for him—but the inherent cultural significance was entirely lost on her. Indeed, a deeper look at the analysis put forth here shows a conspicuous silence on the topic of Amos as a member of the Sabra generation and ethos. Only upon reflection after the fact, and after hearing the analyses done by the other authors of this special issue, did she even notice this absence at all. 66 However, the second author of this paper is only 22 years younger than Amos, spent the majority of his life in Israel, and has both native- born children and grandchildren. He (Y.T.) was a “graduate” of the same socialist Zionist pioneering youth movement as Amos; served as a soldier in the kibbutzim branch of the Israeli army (considered the continuation of the pre-State Palmach); is a veteran of the Six Day War; and was a member of the first group to establish a new army-kibbutz settlement. The pioneering kibbutz of which he was a member was, in fact, founded by men and women of Amos’s generation, for whom he has a profound admiration and understanding, and with whom he identifies strongly. He sees himself as having adopted much of the values system intrinsic to Amos’s generation, and thus feels a connection with and sense of belonging to it. Therefore, he was able to both identify with Amos’s life story and “‘double-check” the analysis from a cultural view, finding nothing lacking from a sign-oriented analytical perspective. 67 Ultimately, this reflection serves to highlight another of our method’s strengths—that is, its applicability not only across texts but across analysts. One need not be an insider of the culture or society involved in a text, and one need not have intimate knowledge of the narrator’s stories or experiences. A sign-oriented linguistic analyst must simply stay deeply and uncompromisingly connected with the text under analysis, and the linguistic meanings and extra-linguistic messages will thus emerge intrinsically. Indeed, upon our first reading of Amos’s text, both authors immediately remarked upon the splits throughout the narrative, which were both categorical and holistic and which existed in both content and form. Amos’s divided text indeed reflected his identity as a divided man—literally (physically, cognitively, and emotionally), figuratively, and textually. 1 Alison Stern Perez would like to acknowledge the Kreitman Fellowship Foundation, the Center for Training and Research on Resilience and Coping with Trauma at Sapir Academic College, and the Israel Trauma Coalition for Response and Preparedness for their support. 2 This phenomenon is referred to as “pro-drop” in the formal-syntactic linguistic literature. 3 All standard-font numbers in parentheses will represent line numbers in the original text of Amos’s life story, and all italicized numbers in parentheses will refer to the specific entry in the relevant table. 4 The numbers to the left of each entry signify where it was located in the overall order of 73 entries, and three dashes signify a significant break in the given sequence of each “poem,” during which other pronouns were used. 5 This phrase appears in English as an “I”-statement, but in Hebrew has a different construction. Therefore, it was not counted in the pronoun poems of the original text. 6 This is another phrase that appears in English as an “I”-statement but has a different construction in Hebrew, and thus was also not counted in the original pronoun analysis. 7 This excludes entry 5, which did not have a collocated verb at all. 8 Again, the numbers to the left of each entry signify where it was located in the overall order of the entire text, but here, three dashes signify a break in the sequence of each poem that occurred only because the other tense was used. 9 Entry 44 is not included in this table, as it did not have a collocated verb. 10 It should be noted that the phrase, “since then,” appears in both columns. This phrase may be viewed in this text as being at least partially time-neutral, as it provides a chronological landmark—a specific time marker referring to a particular point in time—without necessarily functioning as an overt marker of movement within time. It points out a boundary in or distinguishes a point between two distinct periods of time in both of the above usages, but does not imply movement—either forward or backward, discursively or chronologically. This meaning of the phrase is even further supported by the context of the rest of the sentences in which it was placed in Amos’s text—“Since then I have been at Gev,” and “Since then I’m bound to the chair”— which are much larger in scope and unlimited in time than the other entries in the chronological category. This stands in contrast to the phrase, “after that,” for instance, which can also be interpreted as time-neutral, but is used by Amos in a manner that is not only highly chronologically-focused—marking specific, shorter-range, and sequential events—but also significant in its repeated and non-randomly distributed pattern. Andersson, K. (2008). Constructing young masculinity: A case study of heroic discourse on violence. Discourse & Society, 19, 139-161. Andrews, E., & Tobin, Y. (Eds.) (1997). Towards a calculus of meaning: Studies in markedness, distinctive features and deixis (Studies in Functional and Structural Linguistics 43). Amsterdam, The Netherlands: John Benjamins. Aphek, E., & Tobin, Y. (1989/1990). The semiotics of fortune-telling (Foundations of Semiotics 22). Amsterdam, The Netherlands: John Benjamins. Aphek, E., & Tobin, Y. (1988). Word systems in modern Hebrew: Implications and applications (Contributions to the Sociology of Jewish Languages 3). Leiden: The Netherlands: E.J. Brill. Contini-Morava, E., & Sussman Goldberg, B. (Eds.) (1995). Meaning as explanation: Advances in linguistic sign theory (Trends in Linguistics: Studies and Monographs 84). Berlin, Germany: Mouton-Walter de Gruyter. Contini-Morava, E., & Tobin, Y. (Eds.) (2000). Between grammar and lexicon (Current Issues in Linguistic Theory 183). Amsterdam, The Netherlands: John Benjamins. De Jonge, B., & Tobin, Y. (Eds.) (2011). Linguistic theory and empirical evidence (Studies in Functional and Structural Linguistics 64). Amsterdam, The Netherlands: John Benjamins. Davis, J., Gorup, R., & Stern, N. (Eds.) (2006). Advances in functional linguistics: Columbia School beyond its origins. Amsterdam, The Netherlands: John Benjamins. Diver, W. (1969). The system of relevance of the Homeric verb. Acta Linguistica Hafniensia, 12, 45-68. Dreer, I. (2007). Expressing the same by the different: The subjunctive vs. the indicative in French. Amsterdam, The Netherlands: John Benjamins. Francis, B. (2002). Relativism, realism, and feminism: An analysis of some theoretical tensions in research on gender identity. Journal of Gender Studies, 11, 39-54. Gorlach, M. (2004). Phrasal constructions and resultativeness in English: A sign- oriented analysis. Amsterdam, The Netherlands: John Benjamins. Kirsner, R., Contini-Morava, E., and Rodriguez-Bachiller, B. (Eds.) (2004). Cognitive and communicative approaches to linguistic analysis. Amsterdam, The Netherlands: John Benjamins. Kleinman, A. (1988). The illness narratives: Suffering, healing, and the human condition. New York, NY: Basic Books. Kroger, R.O., & Wood, L.A. (1998). The turn to discourse in social psychology. Canadian Psychology/Psychologie Canadienne, 39(4), 266-279. Lieblich, A., Tuval-Mashiach, R., & Zilber, T. (1998). Narrative research: Reading, analysis, and interpretation. Applied Social Research Methods Series, Vol. 47, Thousand Oaks, CA: Sage. Miller, J.H. (1978). The problematic of ending in narrative. [Special Issue: Narrative Endings]. Nineteenth-Century Fiction, 33(1), 3-7. Pennebaker, J.W. (2002). What our words can say about us: Toward a broader language psychology. Psychological Science Agenda, 15, 8-9. Perez, A.S., & Sagy, S. (2011). “Ein etzli ba’lexicon pachad” mul “Atah lo normali im atah lo tefached”: Hasiach haishi v’hahevrati shel nahagei autobus yisraelim shehavu hatkafat terror. (“There is no fear in my lexicon” vs. “You are not normal if you won’t be scared”: The personal and societal discourse of Israeli bus drivers who experienced a terror attack.) In Litvak-Hirsch, T. & Chaitin, J. (Eds. ), Drachim mitztalvot: Darkei hitbonenut psychologit-hevratit al hahevrah hayisraelit b’ikvot Dan Bar-On (Intersecting paths—In Dan Bar-On’s footsteps: Psycho-social ways of reflecting on Israeli society), (pp. 165-76). Be’er Sheva, Israel: Ben-Gurion University Press. Perez, A.S., & Tobin, Y. (2010). Ha’avarat hameser derech teoria lashonit-semiotit: Nituach shel hashimush b’ma’arechet hamilim “Lamed-Mem-Dalet” ba’hodaot mekuvanot shel kehilat morim. (Getting the message across through linguistic- semiotic theory: An analysis of the usage of the word system “L-M-D” in the online messages of a community of teachers.) In Kupferberg, I. (Ed. ), Heker hatext v’hasiach: Rashomon shel shitot mechkar (Text and discourse analysis: A ‘Rashomon’ of research methods). Be’er Sheva, Israel: Ben-Gurion University Press, pp. 47-64. Perez, A.S., & Tobin, Y. (2009). Difficulties of translation from Israeli Hebrew to American English: An analysis of pronouns and power relations in interviews with bus drivers who experienced terror attacks. [Special issue: Lost (and Found) in Translation]. Graduate Journal of Social Sciences, 6(3), 86-107. Perez, A.S., Tobin, Y., & Sagy, S. (2010). “There is no fear in my lexicon” vs. “You are not normal if you won’t be scared”: A qualitative semiotic analysis of the ‘broken’ discourse of Israeli bus drivers who experienced terror attacks. In Hyvärinen, M., Hyden, L-C., Saarenheimo, M., & Tamboukou, M. (Eds. ), Beyond narrative coherence: Studies in narrative (pp. 121-146). Amsterdam, The Netherlands: John Benjamins. Potter, J. (2003). Discursive psychology: Between method and paradigm. Discourse & Society, 14(6), 783-794. Potter, J., & Wetherell, M. (1987). Discourse and social psychology. London, England: Sage. Reid, W., Otheguy, R., & Stern, N. (Eds.) (2002). Signal, meaning and message: Perspectives on sign-based linguistics. Amsterdam, The Netherlands: John Benjamins. Spector-Mersel, G. (2010). Narrative research: Time for a paradigm. Narrative Inquiry, 20(1), 204-224. Spector-Mersel, G. (2014). Guest Editor’s Introduction: Multiplicity and commonality in narrative interpretation. [Special Issue]. Narrative Works4(1), 1-18. Tobin, Y. (2005). Le duel en Hebreu: categorie grammaticale ou lexicale? (The duel in Hebrew: Grammatical or lexical category?). [Special Issue: Les Langues Chamito-Sémitiques (Afro-Asiatiques). The Chamito-Semitic (Afro-Asiatic) Languages]. Fait de Langues 26(1), 129-146. Tobin, Y. (2002). Conditionals in Hebrew and English: The same or different? Travaux de Cercle Linguistique de Prague, nouvelle série/Prague Linguistic Circle Papers, 4, 129-142. Tobin, Y. (1994/1995). Invariance, markedness and distinctive feature analysis: A contrastive study of sign systems in English and Hebrew. Amsterdam, The Netherlands: John Benjamins; Beer Sheva, Israel: Ben-Gurion University of the Negev Press. Tobin, Y. (1993). Aspect in the English verb: Process and result in language (Longman Linguistics Library Series, 27). London, England: Longman. Tobin, Y. (1990). Semiotics and linguistics. London, England: Longman. Tobin, Y. (Ed.). (1989a). From sign to text: A semiotic view of communication (Foundations of Semiotics 20). Amsterdam, The Netherlands: John Benjamins. Tobin, Y. (1989b). Space, time and point-of-view in the Modern Hebrew verb. In Y. Tobin (Ed. ), From sign to text: A semiotic view of communication (pp. 61-92). Amsterdam, The Netherlands: John Benjamins. Tobin, Y. (Ed.). (1988). The Prague School and its legacy in linguistics, literature, semiotics, folklore and the arts (Linguistic and Literary Studies in Eastern Europe 27). Amsterdam, The Netherlands: John Benjamins. Tobin, Y., & Perez, A.S. (2009). Linguistic sign systems indicating proximity and remoteness in the ‘troubled talk’ of Israeli bus drivers who experienced terror attacks. Iyunim b’Safa v’Hevra (Israel Studies of Language and Society), 2(2), 144-168. Waisman, O.S. (2010). Body, language and meaning in conflict situations: A semiotic analysis of gesture-word mismatches in Israeli-Jewish and Arab discourse. Amsterdam, The Netherlands: John Benjamins. Wetherell, M. (1998). Positioning and interpretative repertoires: Conversation analysis and post-structuralism in dialogue. Discourse & Society, 9, 387-412. Widdowson, H.G. (2007). Discourse analysis. London, England: Oxford University Press. Alison Stern Perez, MA, is a PhD student in Social Psychology at Ben-Gurion University of the Negev, Israel. Her work focuses on the interplay between individual and societal discourse, and the influence of this relationship on coping and resilience after a traumatic event; and she employs an interdisciplinary methodology based on socio-psychological qualitative discourse analysis and sign-oriented linguistics. She has published five articles on her research. Yishai Tobin, PhD, is a professor in the Department of Foreign Literatures & Linguistics and the Department of Behavioral Sciences at Ben-Gurion University of the Negev, Israel. He is author and editor of 17 books and over 200 articles in the fields of developmental and clinical phonetics and phonology, discourse and text analysis, and semiotics. He is editor of the series Studies in Functional and Structural Linguistics at John Benjamins Publishing Company and serves on the editorial boards of several international linguistics journals. His research reflects a cognitive and functional approach to language as a system of signs used by humans to communicate. limped along a bit. And then (they) actually began…to run after me. community, community coordinator, I was treasurer. That’s my life. you want to hear? Interesting? * Transcription and notes, Spector-Mersel (2014). 1 In colloquial Hebrew, the third-person masculine plural verb form ("they sent me") is commonly used to send a passive message that defocuses the agent; either because it is unknown or irrelevant, or contrarily, obvious and primary. When "they" (or any other pronoun) is in parentheses, it signifies that the pronoun itself is not used with the related verb. 2 A cooperative Zionist settlement established in the 1920s. 3 Both are well-known schools identified with the Zionist settlement. 4 A Zionist youth movement. 5 Literally, the acronym for “strike force,” the Palmach was the elite fighting force of the Haganah, the underground army of the pre-state Jewish settlement under the British Mandate in Palestine. 6 Under the British Mandate in Palestine, youth group movements that were mobilized toward agricultural settlement would go out to kibbutzim for a training period. 7 Abbreviation for United Kibbutzim Movement, the umbrella organization of all the kibbutzim.